I love this dryer! I've had it for about 7 months and it has been great! The biggest difference between it and a regular top load dryer is how gentle it is on my clothes. It doesn't produce as much lint, which seems to indicate that it isn't as hard on the fabrics. I have sweaters that I used to take to the dry cleaners that I now can wash and dry at home--fantastic! 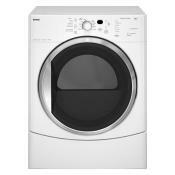 In my opinion, the main downside is the price (super pricey compared to regular top load dryers). We got a deal on ours because the exterior of it was damaged--so it was definitely worth it for what we paid for it (about 200 bucks). However, I'm not sure that I would fork out $600 or $700 for it. Maybe those prices will start to go down soon (like microwaves did when they first came out). If you decide to go for it, I would recommend splurging on the pedestal that goes under it as well. It will make it a little easier on your back and a little less awkward to load. All in all, I'm very happy with my Kenmore HE and would highly recommend it.